If you are simply mad about Moshlings, and wish to learn all about the wacky little critters, and would like to customise your very own Moshling, and own an iPhone, there is an app called Moshi Monsters: Moshlings available that lets the user read about them, get their hands on them and even customise the Moshlings. 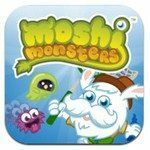 The Moshi Monsters: Moshlings app is for the iPhone and Apple iPad and features in excess of 60 Moshlings, the little pets that Moshi Monsters love to collect, and also delivers secret codes so the user can catch Moshlings at MoshiMonsters.com. The Moshi Monsters: Moshlings iOS app lets the user read about Moshling personalities, habitats, and more, create wallpapers for your mobile, save your artwork at the touch of a button, and has 100 stickers so you can customise your Moshlings that can be scaled and rotated. The Moshi Monsters: Moshlings app can be downloaded to your iOS device at a cost of just $0.99 by hitting up iTunes. Also there is the Moshi Monsters: Buster’s Lost Moshlings app for the iPhone and iPad, an app that lets you search Monstro City to help Buster Bumblechops locate all his missing Moshlings. The Moshi Monsters: Buster’s Lost Moshlings iOS app features 6 detailed scenes of Monstro City, a tracker mode to help players find the missing Moshlings, a Time Challenge mode to locate the Moshlings before they get Glumped, with 62 Moshlings to collect and store in your zoo. With the Moshi Monsters: Buster’s Lost Moshlings app you get to collect trophies, touching scenes reveals hidden animations, whilst explorer mode lets you search for missing Moshlings on your own. The Moshi Monsters: Buster’s Lost Moshlings app is again available from iTunes at a cost of $0.99.